But wouldn’t post with it. Please click on the article and it will come up large enough to read. Same with the Dell page in the “no place like home” blog. Oh, this still brings tears. Rest in the arms of the angels, dear little one. I can’t really read the article, but unfortunately, I get the idea. I also can’t “like” this one…just too sad. 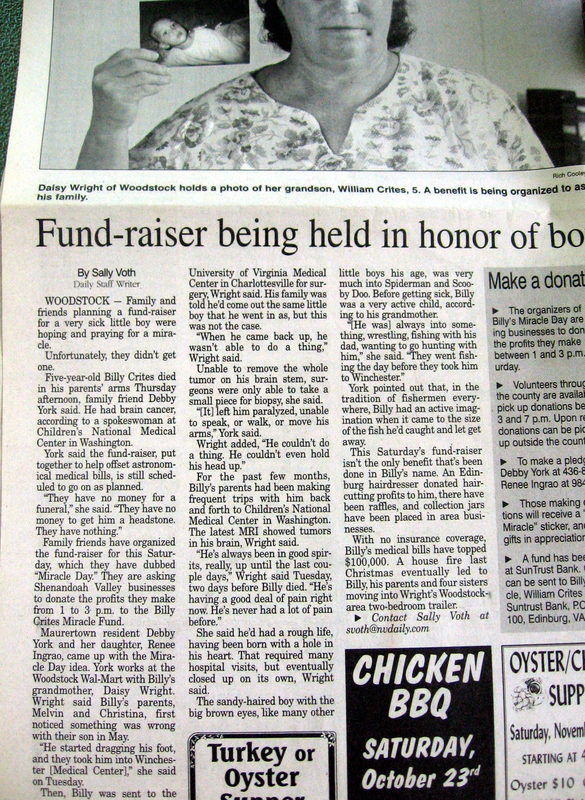 It has been years, and when I ran across this article with Billy’s photo while looking for something else, I had to put it down so as not to drip tears on it. My youngest daughter, Megan, (then 11) and I were in the car on the road for many hours each day for almost 3 weeks straight. I just wish that all the good people who donated and sent prayers and love could have saved him.